One of the very nicest gis I’ve had the privilege of reviewing. The Deus Fight Co. Original Limited Edition BJJ Gi is one of the most lightweight and comfortable gis I’ve ever seen. Deus is unabashedly religious in their themes, so if you are a devout Christian this is the gi for you! I received Deus’ gi not really knowing what to expect. They included their awesome “Royce Beats Everyone” as well as some marketing materials for some of their philanthropic projects. I was kind of biased against the gi because I am not a Christian and the overtly Christian themes would be a bit of a deal breaker for me if I were on the market for a new gi, but the gi itself absolutely fantastic. I got it right after Chanukah so I dubbed it my Chanukah gi. As a side note, Gi Reviews did a company profile of Deus a while back. They are a Christian organization with many philanthropic goals. Part of the money you spend on their products goes to a good cause. 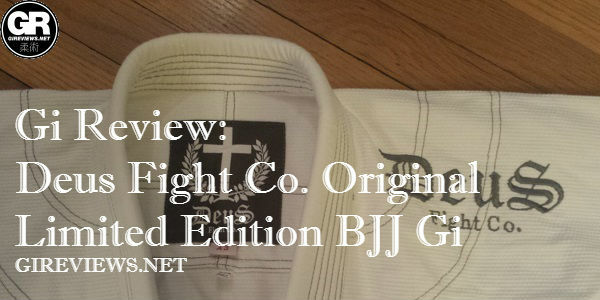 Gi Reviews did an interview with Deus Fight Co a while back, check it out if you are interested in learning about them and their mission. This gi is an A3. As I always mention the very best size for my build is A2L (6’1 195) but I can wear A3. This gi is cut a bit longer and slimmer than most A3’s that I’ve tried and thus fits me like an A2L, which, from me, gets two thumbs up. If you’re shorter and stockier this gi may be inappropriate, but this is a perfect fitting gi for my build. The key word that comes to mind when I look at this gi is “Clean”. The design is clean. Simple, white gi with medium grey contrast stitching and details. The top has a single logo hit on the left shoulder and the company “crest” (a cross between olive branches) on the bottom of the left lapel. The pants have a single logo hit at the bottom of the left leg. One focal detail that Deus chose to go with is a grey twill gusset in their lightweight rip stop pants. All of the seam tape is white rip stop and the lapel is covered with white rip stop, but the piping (and gusset) are grey twill. Another neat little detail the gi has is an excerpt from Psalm 23 in calligraphy print on the inside of the left side of the jacket. This didn’t peel over the course of the 6 months I spent rolling in this gi which to me is a feat in and of itself. Deus says that the jacket of this gi is 450 GSM pearl weave. This is by far the lightest weight and most comfortable 450 GSM pearl weave I’ve ever worn. Deus would be well advised to continue using this specific fabric for all of their gis. Seriously. So comfy. Also it helps that the gi top fit perfectly fresh out of the bag and experienced negligible shrinkage. The lapel on this gi is nice and thick. It has an EVA foam interior to inhibit bacterial growth. I’ll keep saying this: Deus hit the nail on the head when they designed this gi. The design points on this gi top are all on the left side of the jacket. The company name is written in calligraphy on the shoulder, there is a company Crest near the bottom and the inside has an excerpt from Psalm 23. Deus put rip stop seam tape throughout the top as well as on the lapel, and a strip of rip stop across the bottom of the skirt. All of the piping is grey twill and the contrast stitching is grey. The pants fit like the top. Perfectly. The soft, cottony rip stop is perfect for hot days on the mat. Perhaps my only complaint about the entire gi is that Deus chose to use twill for the gusset instead of gi material. I love gi material gussets. Deus went with 6 loops and a stretchy rope with the ends tied off and slightly melted. The knots didn’t come undone throughout the entire time I tested the gi. Given the PERFECT fit, the gi performed great. The fact that it’s so nice and light and the lapel is very thick gave it a great feel when rolling. I also found that the specific placement of the embroidery at the bottom of the skirt acted as a friction point for my belt, helping my belt stay put a bit longer than on other gis. A minor point but noteworthy. There are very few moments when I am jealous of Christians, wearing this gi I had a few of those moments. Seriously, awesome gi. If the branding suits your tastes and you are on the lanky side don’t hesitate. Disclosure: This Gi was submitted to me free of charge (by way of gireviews.net) for review. I have never done any work with or for Deus Fight Co.
Nice gi! Well-written review. Very helpful. Thanks!